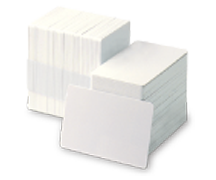 Find blank PVC cards and plastic ID cards at factory prices – as low as $0.065 each! We stock a huge inventory of standard CR-80 sized cards in white, probably the most versatile card on the market, and carry cards in a range of other sizes and thicknesses, in a rainbow of colors, and with smart card technology capabilities. Whatever card type or brand your ID card issuance program calls for, you’ll find it at enjoyrfid.com. Why buy blank pvc card from enjoyrfid.com?